CARMEL, CA — The confetti has flown and this year’s Best of Show at the 2105 Pebble Beach Concours d’Elegance has been chosen. 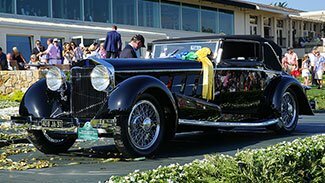 In the midst of the tension and excitement here at the Pebble Beach Golf Club, a 1924 Isotta Fraschini Tipo 8A Cabriolet, an elegant gentleman’s sport touring car, has been chosen the Best of Show for this 65th Annual Grand Concours. The proud owners are Jim and Dot Patterson of Louisville, Kentucky. Here are some of the photos captured at the event by Bob Boberg of eClassicAutos.com for our Cars On Line readers. The Italian made 1924 Isotta Fraschini Tipo 8A Cabriolet was coach built on a 145-in chassis for show competition in the early 1930’s in Europe. It was recently restored to this condition just in time to be shown here at the 2015 Pebble Beach Concours d’ Elegance. 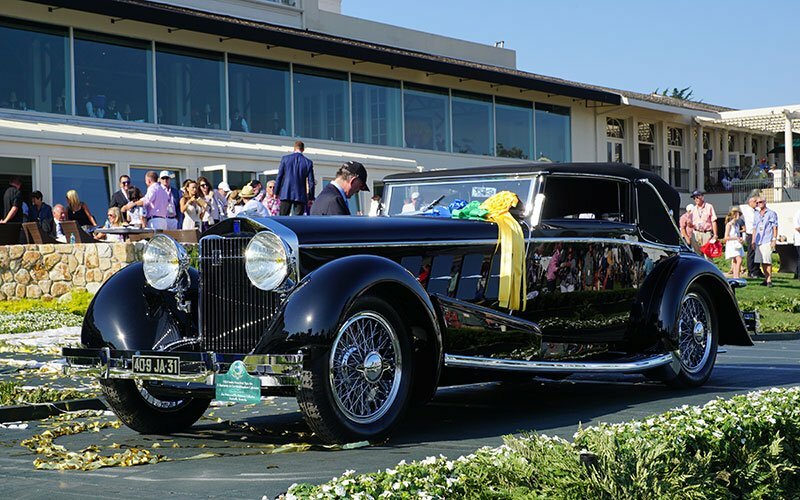 Click here to read the full story on the 2015 Pebble Beach Concours d’ Elegance as well as see photos of all the top awarded motorcars. Well this is the day everybody had been waiting for here on the Monterey Peninsula where the 2015 Pebble Beach Concours d’Elegance was held at the Pebble Beach Golf Links. Here at the 18th fairway of the famous golf course on the Carmel Bay were gathered some of the finest vintage motorcars of all time. To be considered the Best of Show here at the 2015 Pebble Beach Concours is the highest award you can achieve in the collector car hobby. 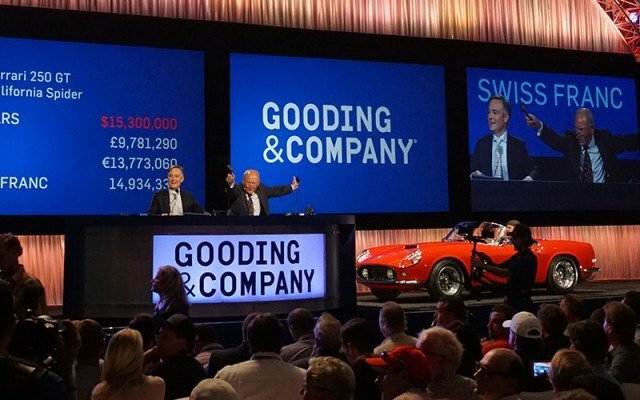 The afternoon judging at the 2015 Pebble Beach Concours was hardly over when the Gooding & Company Auction got into full swing. And they did not disappoint. 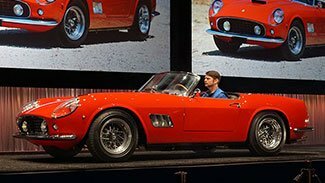 A 1961 Ferrari 250 GT SWB California Spider was the top sale of the night crossing the block for a cool $15,300,000 price tag. This was not the top sale of the week however. 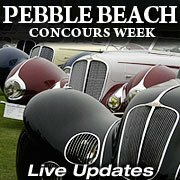 Click this link to view all of the auction action and see the prices as Bob Boberg and his wife Donna covered Concours Week here at the 2015 Pebble Beach Concours. The world’s grandest car event is held here on the 18th hole at the Pebble Beach Golf Links. It is the culmination of a week-long festival of events and collector car auctions like you have never seen before in your life. We’ll attempt to give you a little taste of what this event is like. Follow this page all weekend as we update with photos and fast facts about the auctions and action from Monterey’s weeklong auto extravaganza. These cars make the difference when both black-tie bourgeoisie and baseball cap crowned gearheads stand shoulder to shoulder craining their necks to get a look. Click here to see photos from the Pebble Beach Tour D’Elegance as historic cars arrived back at Pebble Beach after their tour. There will be serious money here during Concours Week as four big name auction companies auction off top tier collector cars in the shadow of the 2015 Pebble Beach Concours d’Elegance. Although the Concours is what brings most collectors to the peninsula on the Pacific Ocean this week, a number of top name auction companies are also here to ween buyers for their top collector car offerings. Saturday night was the “big show” for the Pebble Beach Concours Week Auctions with both the RM/Sotheby’s and Mecum Auctions drawing a large number of buyers. 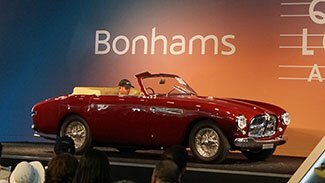 The top sale was a 1956 Ferrari 250 GT Berlinetta which sold for $12,000,000 at the RM/Sotheby’s Auction Saturday evening. Click here to view the top cars and sales prices from the RM/Sotheby’s Auction. 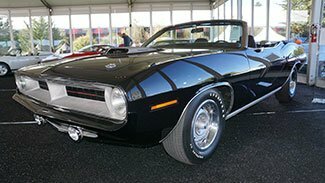 On Friday evening a black 1970 Plymouth Hemi Cuda Convertible crossed the auction block at the Mecum Auction in Monterey. The official sales price was $2,250,000 before commission. It was the top sale for Mecum tonight as the Monterey Auctions are underway here during Concours Week in the buildup to the Pebble Beach Concours d’ Elegance on Sunday. Cars On Line will be on hand to bring you the action all weekend in photos and video from the Monterey Penninsula. Here is a link to the results of the Pebble Beach Concours Week Auctions. Here are some highlights from the 2015 Pebble Beach Concours and the big sales here at Monterey’s Concours Week Auctions. 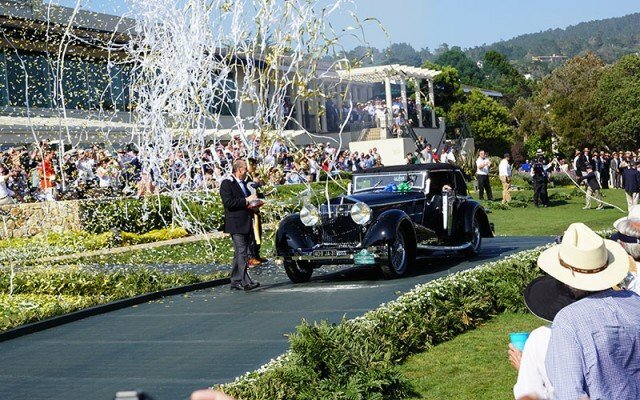 A 1924 Isotta Fraschini Tipo 8A Cabriolet wins 2015 Pebble Beach Concours Best of Show. Click here to see more photos and full story on the winner and runners up from this year’s show. 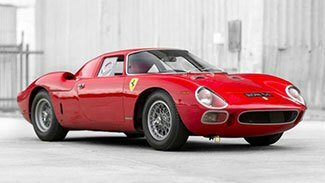 Highest sale of the week was at the RM/Sotheby’s Auction in Monterey, a 1964 Ferrari 250 LM by Scaglietti sold for $17,600,000 on Thursday. (Click here to see more cars and prices from the Pebble Beach Conours Week Auctions. Top car at the 2015 Bonhams Auction, a 1951 Ferrari 212 Inter Cabriolet sells for $2,000,000 on Friday. (Click here to see more cars and prices from the Pebble Beach Conours Week Auctions. A 1961 Ferrari 250 GT SWB California Spider sold for $15,300,000 Sunday night at the Gooding & Company Auction. (Click here to see more cars and prices from the Pebble Beach Conours Week Auctions. 1970 Pymouth Hemi Cuda Convertible sold for $2,250,000 Friday night at the Mecum Auction during Pebble Beach Concours Week. (Click here to see more cars and prices from the Pebble Beach Conours Week Auctions. An estimated 1,100 cars were sold here last year so you can bet there will be lots to see. Bob reported that prices at the Mecum Auction, RM Auction, Gooding & Company and Bonhams Auction were up markedly last year. We counted over 110 cars sold for over seven figures here last year. It was after this show last year that we noticed the collector car market really took off. Prices were escalating on high end classic Ferraris and rare vintage cars and that trend has carried through to today. What will happen this year at Monterey? We’ll know very soon. Stay tuned to this page for all the relavant news.